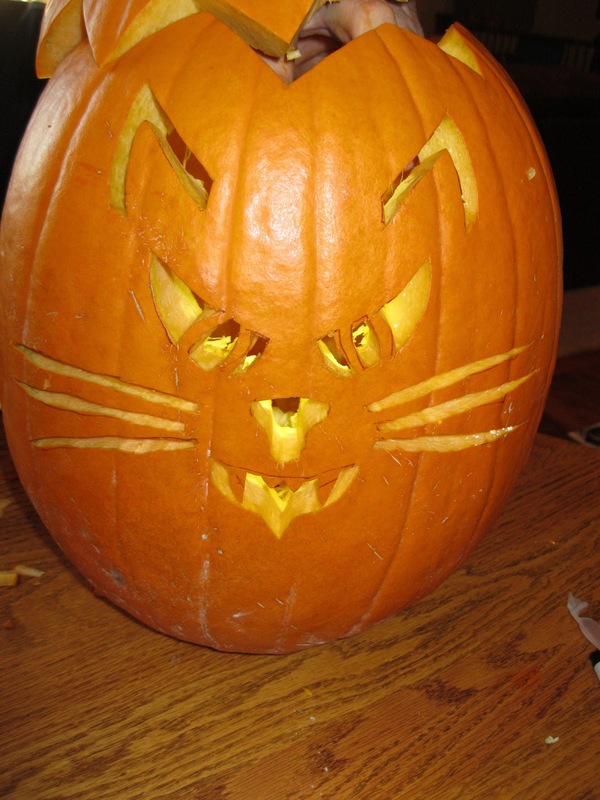 It is here - Halloween! 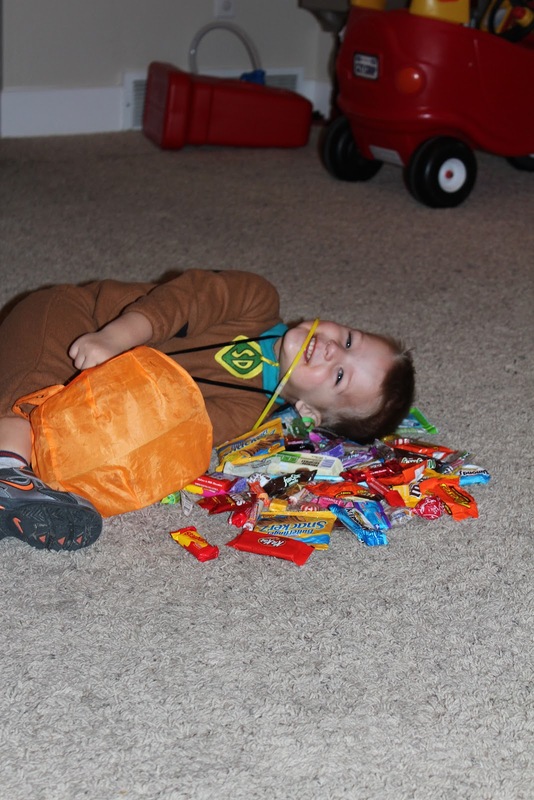 To day is the day that every little kids dream comes true, dress up and get some candy - it is Halloween! After work tonight we started off the festivities with some dinner. The kids munched on ghost nuggets. Then it was time to carve a pumpkin. The kids decided we wanted our pumpkin this year to be a cat. 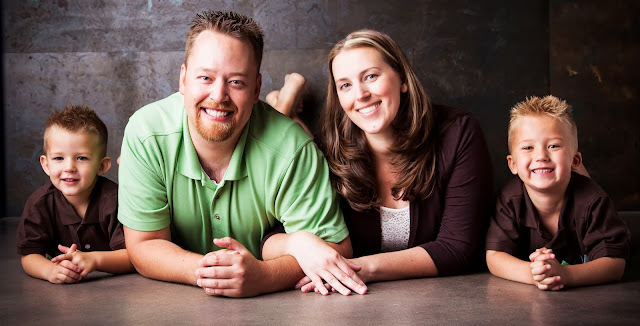 Dustin did a great job! 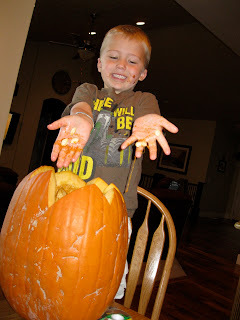 Zach had fun trying to pull out the pumpkin insides. Logan tried too...but didn't like it so much. 6pm came and it was time to hit the streets decked out in costume. Dustin and Zach both dressed up as Captain America. 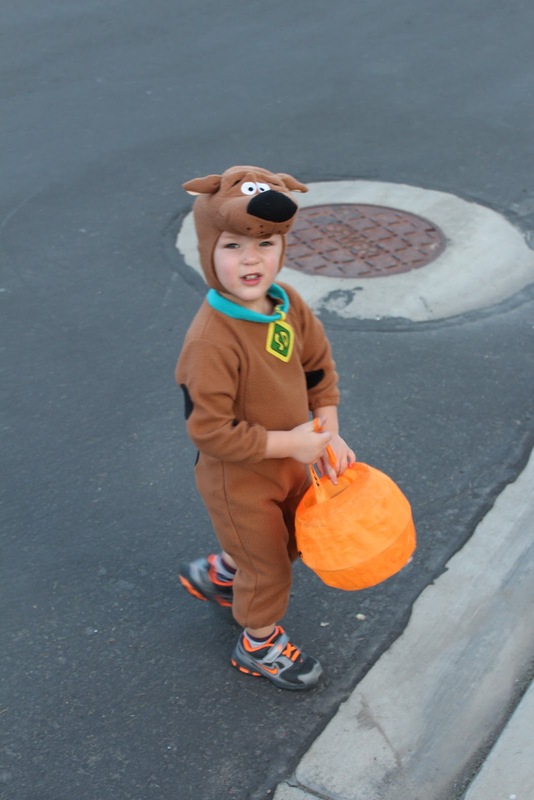 Logan went as Scooby Doo. The kids lasted about a hour trick-or-treating with some of our neighborhood friends. 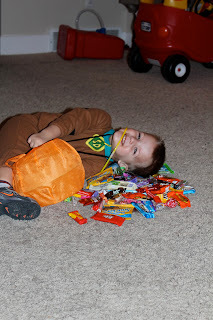 We then went home and checked out the candy stash! Some of our neighbors were telling us about a fishing pond close to where we lived - we decided to met up there tonight after work for a KFC dinner and fishing! We've never taken the kids fishing before so we thought it would be fun. We knew we only had about one hour of sunlight before it would start to get dark. It was taking Dustin a while to get the fishing poles all set up, but that didn't bother the kids....there were plenty of these ducks to entertain us! Our neighbors were smart and brought some bread for the kids to feed the ducks. Logan had fun chasing the ducks all around! Dinner time! KFC hit the spot! So in the one hour of sunlight that we had it was probably spent - 15 minutes of ducks, 10 minutes of fishing, 20 minutes of eating and the rest of the time at the playground. We will have to hit up this location during early summer next year.....maybe we will have better luck catching a fish! Zach: Come on Grandpa. Just you and me are going to the garage to build. They built two cars tonight. 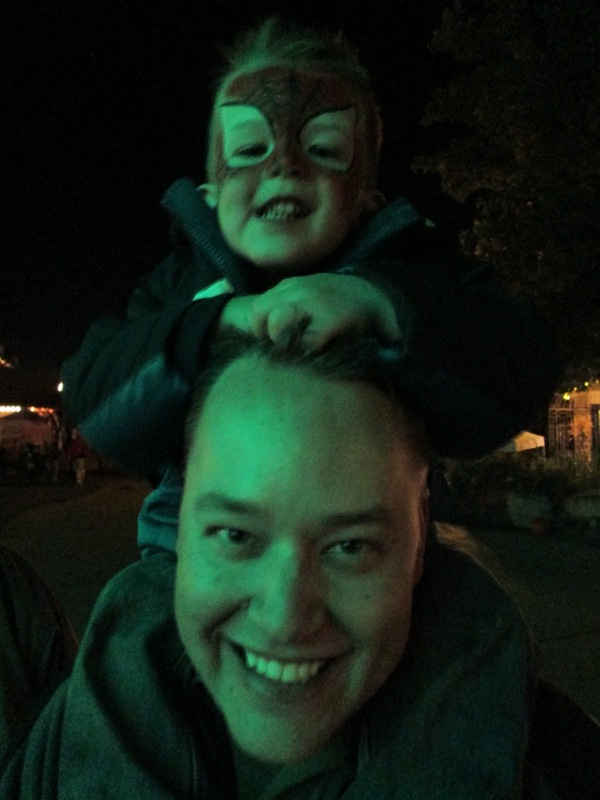 I couldn't tell who was having more fun...Zach or Grandpa Gray! 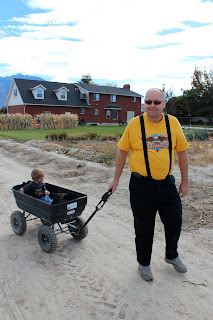 We hit up the Thanksgiving Point Farm today for "Barnyard Boo". The kids always love seeing the animals...today was an added bonus with Halloween themed activites with CANDY! Every time we go to the farm Logan runs to the cows first. 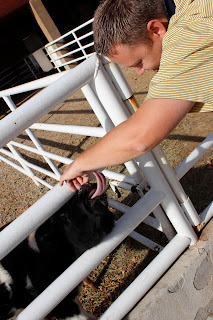 They had some calves out for everyone to pet - Logan made a new friend! Dustin made a new friend too - The calf kept licking him! With CANDY as the prize! The kids had their faces painted - now we are styling. 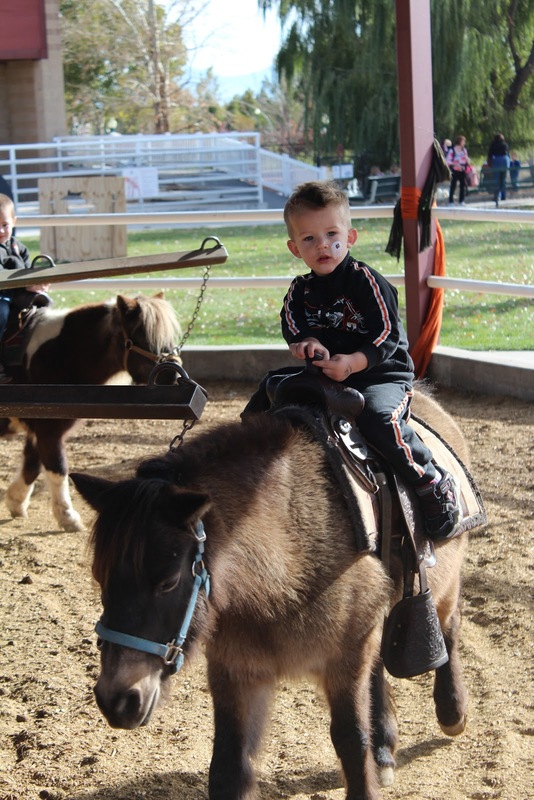 No trip to the farm is complete without the pony rides! 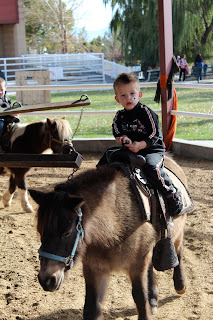 Logan always picks the small pony. Zach picks the biggest horse to ride! Hanging out with the witch! 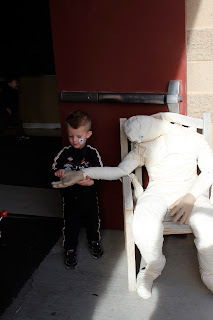 This cracked me up....Logan decided to give the mummy a 'high 5'. There is a new donut place that has rolled into town - Station 13. They say they do donuts "Texas style". We've had them at work a few times and they reminded Jen of a bakery she used to go to as a kid. So this morning when the kids decided to get up at 7am....Jen decided it was time to pack up the kids and pick up some donuts at Station 13! The kids walked into the store and surveyed all the donuts. They had normal sized donuts and the "Texas sized" donuts. Logan walked over to the "Texas sized" sprinkle donut and said that was what he wanted. I showed him the normal sprinkle donut and he said that was okay too (I love that this kid can be easy going). We picked a donut out for everyone and headed back home. The kids must have been really excited to eat the donut, because when we got out of the car at home they RAN to the kitchen table and sat down and waited patiently for the donut to be put on a plate for them. 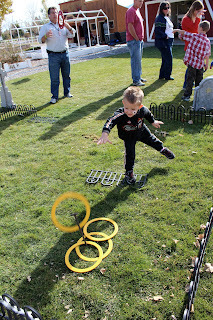 Zach picked a chocolate spider web donut - complete with a plastic spider ring! Logan wanted the sprinkle donut. 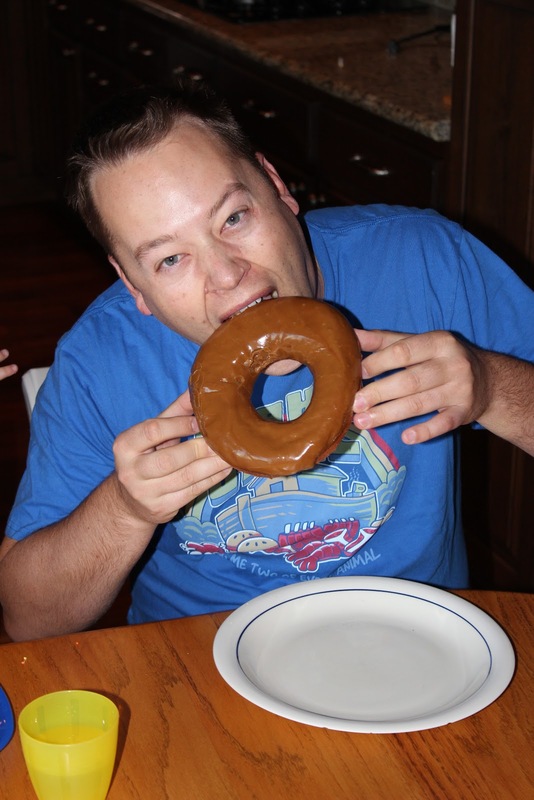 The kids picked out a "Texas sized" maple donut for Dustin....that sucker was HUGE! Jen picked out a red velvet donut...it was oh so YUMMY! Just another picture of how big this "Texas size" donut is. That is our large dinner plate that donut is sitting on. 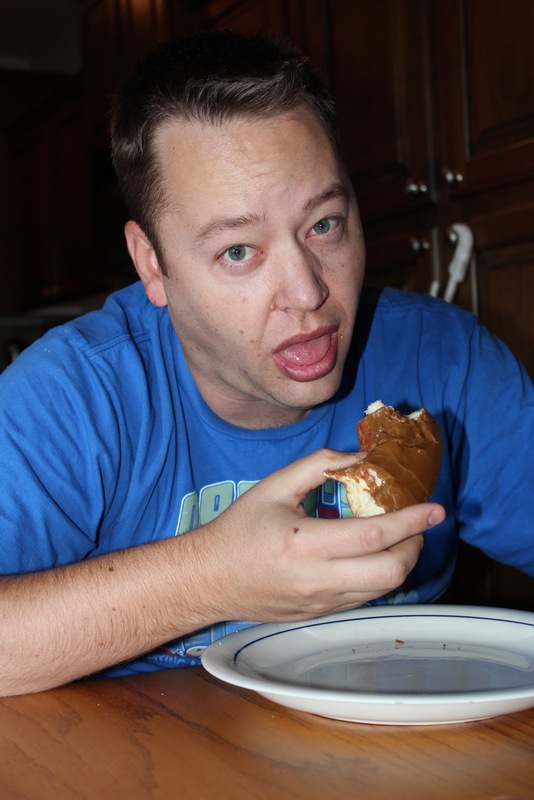 Dustin tried so hard to eat the whole thing...but gave up at the very end. We might be doing this Saturday morning donut run a little more frequently! 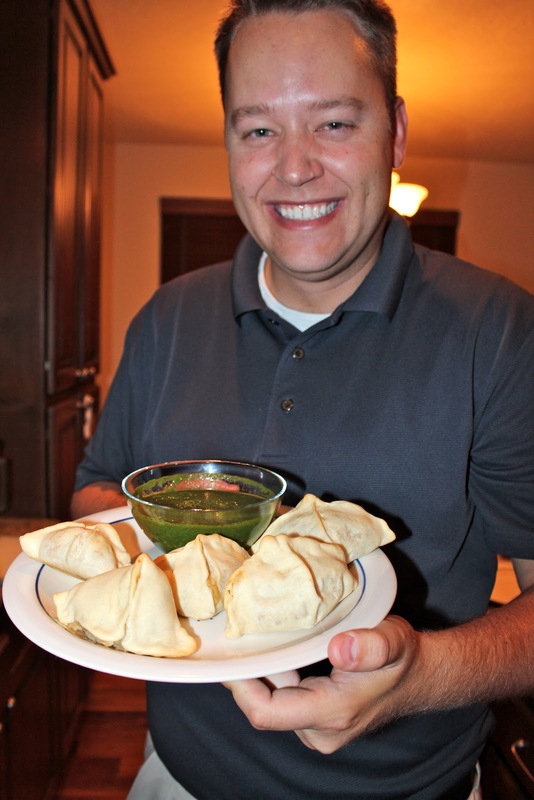 So apparently Dustin and one of his co-workers/friends started smack talking about Indian food.....and it turned into a Samosa making event at our house...complete with take-out from Bombay House. 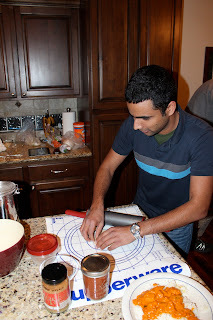 Samosa's take quite some time to make....here is Prashant (Dustin's friend from work who is from India) rolling out the dough. 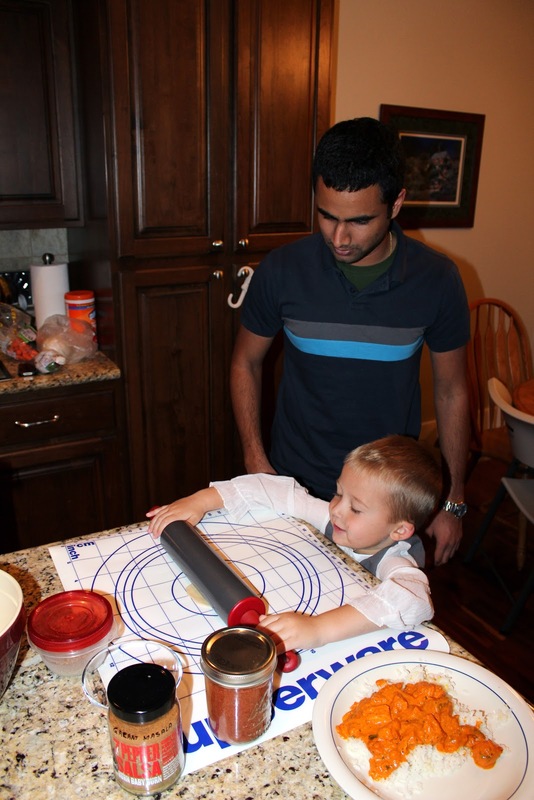 Zach decided he wanted to get in on the Samosa making fun too! 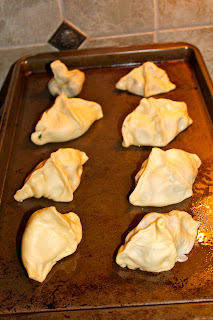 Dustin made the 'insides' for the Samosa's. We decided to try and bake them instead of frying them - going for the healthier alternative. The finished product! Dustin and Prashant even made the mint Chutney sauce from scratch! 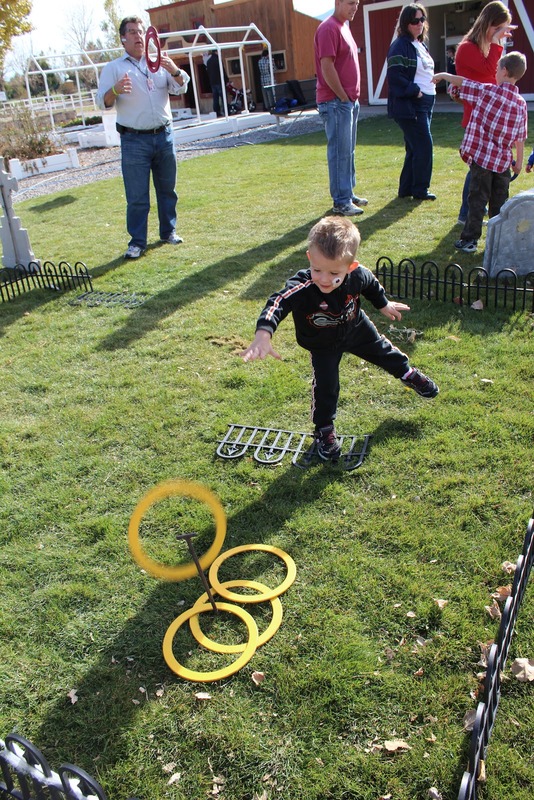 I think we may have a future soccer player on our hands. Glen and Dustin took the kids to the park with their soccer balls...apparently Logan was all over it! 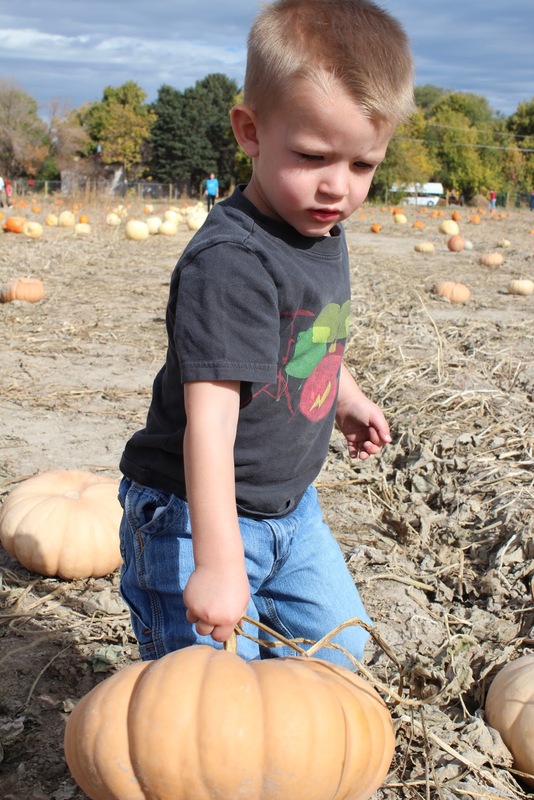 With Glen in town visiting we decided to hit up Maybey's pumpkin patch today. 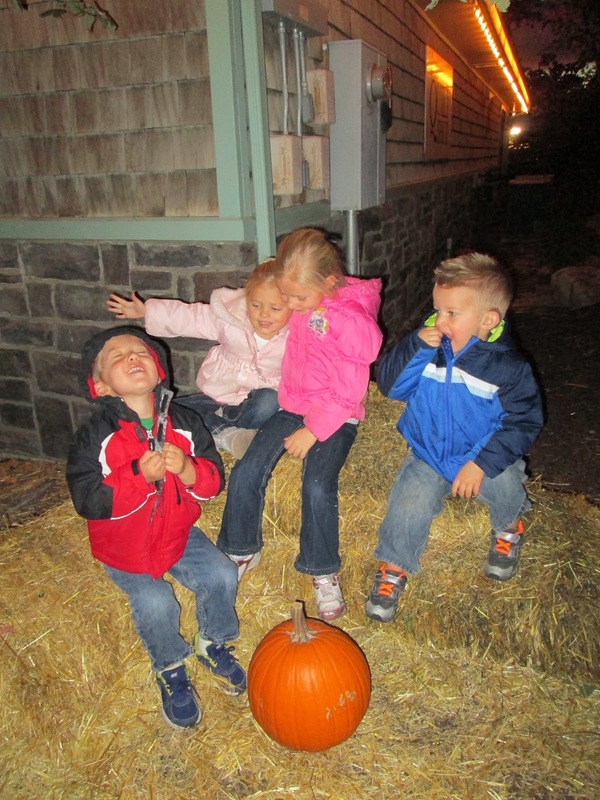 We've been to this pumpkin patch the last few years and always loved it. It is a patch of land that a family owns tucked away in the city of South Jordan. They growth several varieties of pumpkins and then sell them during the month of October. We had already picked up a few pumpkins from the grocery store and Cornbelly's prior to the visit to Maybey's - so we really didn't have any pre set number of pumpkins we intended to buy...we just decided to go and see what they had. 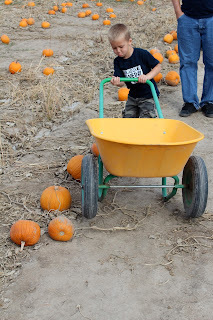 The kids loved that there were carts they could use to put their pumpkins in. Zach picked a yellow one, and was quite adamant that he was driving it through the fields to get pumpkins. Oh, watch out for the pumpkins crazy cart driver Zach! Along the way, Logan stumbled upon this very small blue cart - it was all his! 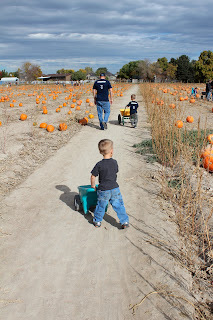 I love this picture....Logan ditched his blue cart at one point to help Jen pick out some pumpkins. 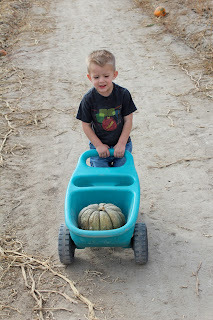 Zach wouldn't have anything to do with that...he carried the little blue cart across the pumpkin field to give it back to Logan. 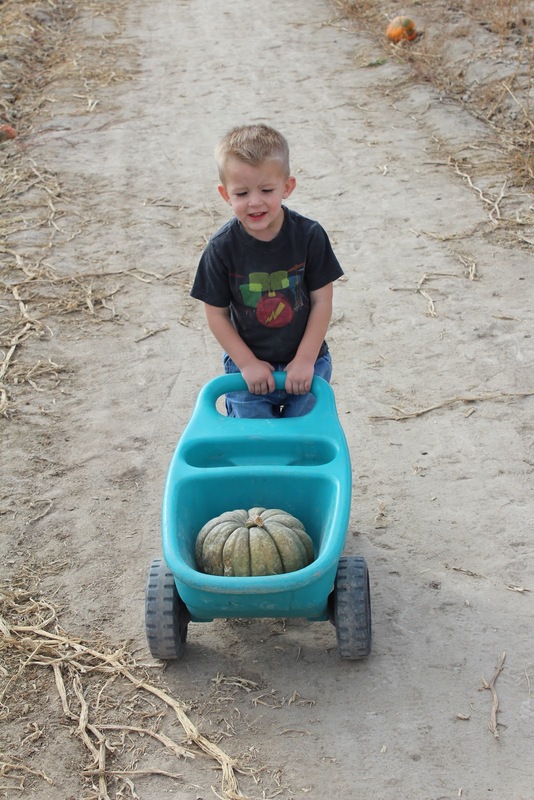 Big brother made sure little brother had a cart for pumpkins. Glen with two of his grandson's! So...we did get a bit carried away with picking out pumpkins at Maybey's. 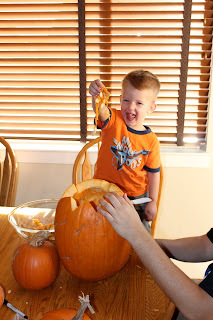 We brought home a total of NINE more pumpkins! Jen fell in love with all the different varieties they had and decided to get them and use them for decorations during Halloween and Thanksgiving. ...and yes, they are all on our front porch! Gardner Village always decorates up for Halloween each year. They have "witches" they strategically place all throughout the site. We decided to head up there tonight with some of our neighbors and all the kids to check it out. Zach, Sydney, Hallie and Logan - this was taken right after we arrived...can you tell we were in for a fun evening?!? 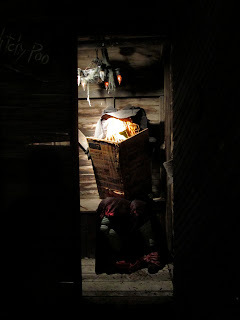 The kids liked this witch the best....she was in the bathroom! 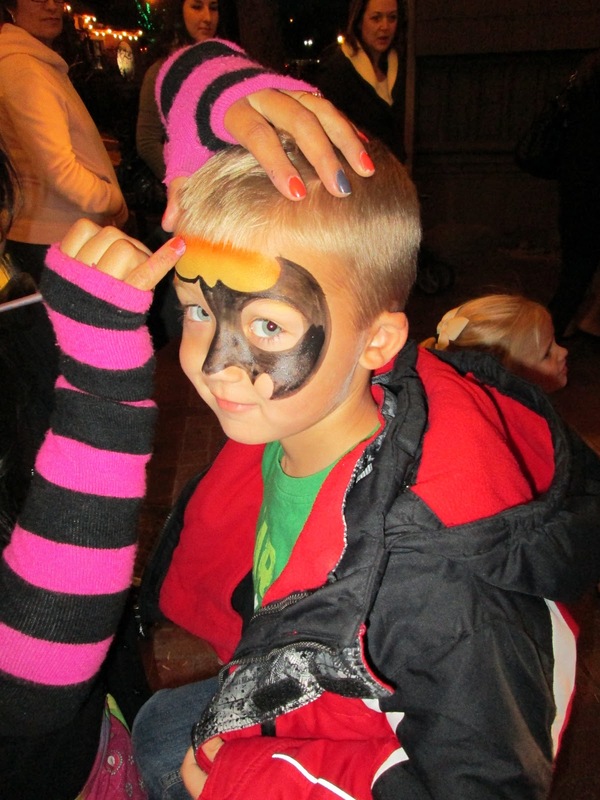 We stumbled upon a few different face painters. 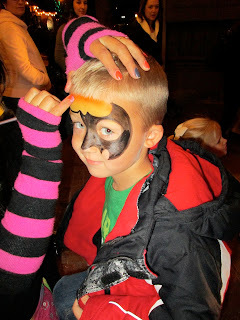 Zach decided he wanted his face painted as Batman. Logan saw what Zach was having done and of course had to join the fun as well! He choose Spiderman. Um, yeah....I think we will throw around some hay. Attempting another group shot, this time with a witch on a bench. Logan scored a shoulder ride from his Dad near the end of the night....he was quite pleased! We had fun. I don't think we had ever been to Gardner Village before. It is more of a girls shopping event type of place - but it was cute to rope the boys into going and hunting down some witches!